Federal agents have raided a gasoline trucking company in Corona that's been tied to two fatal explosions and other accidents. A federal grand jury in Los Angeles has indicted a gasoline trucking company, its owner and two other men on charges they allowed dozens of unsafe tanker trailers to haul volatile fuel across freeways in Southern California for many years. The case alleges National Distribution Services, Inc., also known as Wholesale Distribution, Inc., owner Carl Bradley Johnson, Enrique Garcia, and Donald Cameron Spicer conspired to violate federal safety regulations, after the company was ordered to cease operations following two fatal explosions. NBC4 reported April 11 special agents with the U.S. Department of Transportation's Inspector General's Office had raided the company's truck yard in Corona, seized documents, and arrested Johnson. According to court filings investigators identified at least 42 gasoline tank trailers, " … as posing safety dangers and/or lacking safety documentation." 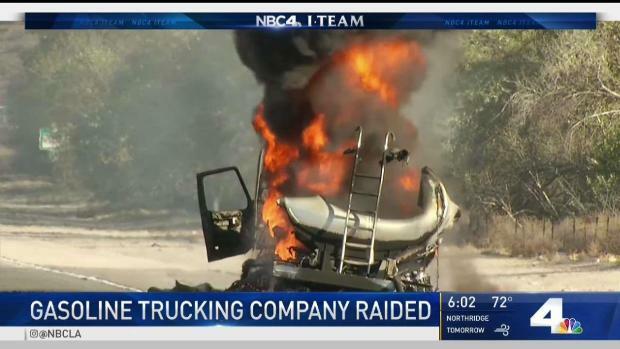 "The government alleges there are unsafe trucks on the roadways on a regular basis," Assistant United States Attorney Matt O'Brien told NBC4 earlier this month. NBC4 watched earlier this month as agents wearing raid jackets searched the yard in Corona where one of the fatal explosions occurred nearly four years ago. The indictment accuses trucking company owner Carl Johansson of allowing welding without required certifications, and a 72-page court filing alleges Johansson used a variety of schemes to dodge safety regulators, and in order to continue operating a gasoline trucking business long after the first fatal explosion 25 years ago. "We’re still reviewing the evidence and have no comment at this point," said Johansson’s defense attorney Trent Packer said after an initial hearing earlier this month. In September 1993 a welder was killed at a truck yard in Montebello when fumes ignited while the welder was making repairs to the inside of a gasoline tank trailer. Five years later Johansson pleaded guilty to federal hazardous materials violations and was sentenced to 15 months in prison, according to court documents. On May 6, 2014 another welder, Samuel Enciso, was killed in an explosion at the truck yard in Corona when a welding torch ignited gasoline fumes. "Enciso was dismembered and declared dead at the scene," wrote a federal agent. A second welder was burned over 50 percent of his body but survived. As a result of the 2014 fatality the Federal Motor Carrier Safety Administration issued an emergency "Out of Service Order" to Johansson and his companies, prohibiting the operation of gasoline tank trailers. According to the criminal complaint, Johansson then changed the company name, paid employees through another entity, and allegedly continued to use the same trailers. A Congressional study characterized trucking companies that mask ownership in order to avoid regulation or other safety enforcement as, "chameleon carriers." "This is a chameleon carrier case," O'Brien said. "I think that’s exactly what’s going on here." Johansson also faces state labor code charges in a separate case stemming from the same 2014 fatality, according to the Riverside County District Attorney's Office.